6th-century mosaic of Jesus at Basilica of Sant'Apollinare Nuovo in Ravenna. 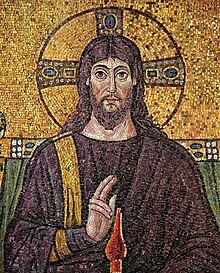 Though depictions of Jesus are culturally important, no undisputed record of what Jesus looked like is known to exist. Traditionally and temporarily, a garden tomb located in what is now the Church of the Holy Sepulchre, Jerúsálẹ́mù. Jésù ti Nasareti (Èdè Grííkì Ayéijọ́un: Ἰησοῦς Iēsoûs; c. 5 BC/BCE – c. 30 AD/CE), bakanna bi Jésù Kristi tabi Jésù, je eni to se koko ninu Esin Kristi, to je gbigba gege bi Messiah to ti je sisotele ninu Majemu Laelae, ti gbogbo awon iru elesin Kristi gba pe ohun ni Omo Olorun ati aworan Olorun ti o ji dide ninu ipo oku. Islamu gba Jesu gege bi woli ati Messiah. Opo awon esin miran ni won tun teriba fun lorisi ona. Jesu je enikan to se pataki ninu itan omo eniyan. ↑ 1.0 1.1 1.2 Sanders (1993).p.11, p 249. ↑ Theologian and bishop Lesslie Newbigin says "the whole of Christian teaching would fall to the ground if it were the case that the life, death, and resurrection of Jesus were not events in real history but stories told to illustrate truths which are valid apart from these happenings." Newbigin, J. E. L. (1989). "The Gospel In a Pluralist Society". London: SPCK. p. 66. ↑ Abdulsalam, M. (19 February 2008). "Jesus in Islam". IslamReligion.com.